All was quiet along the lines at Petersburg yesterday. Grant said, “I will fight it out on this line if it takes all summer.” This boast was uttered in Spotsylvania in the flowery month of May, three months and two days ago. Yesterday was the last day of the summer alluded to, and it found Grant south of the James and Appomattox, having pretty effectually fought himself out, if he has not fought “it out.” The summer being concluded we presume he will consider himself relieved from all obligations to fight or remain longer on “this line,” and free to seek another. 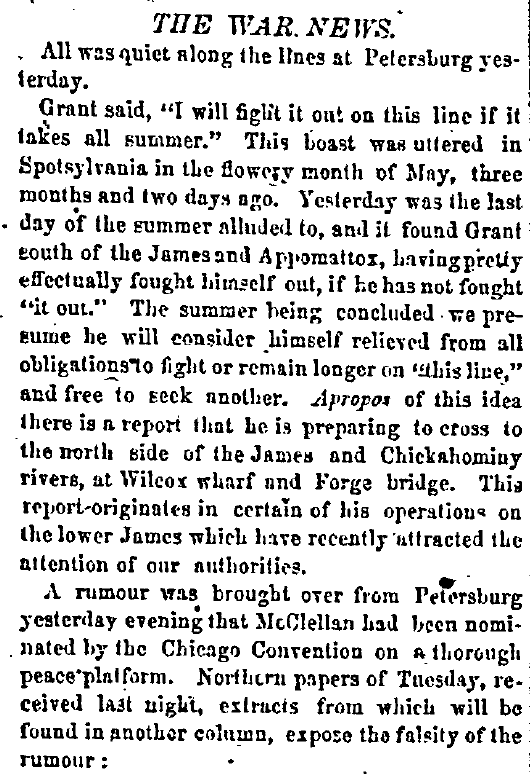 APROPOS of this idea there is a report that he is preparing to cross to the north side of the James and Chickahominy rivers, at Wilcox wharf and Forge bridge. This report originates in certain of his operations on the lower James which have recently attracted the attention of our authorities.